Jack Pearce admitted the Rocks’ home form was disastrous – and conceded it would now be ‘very difficult’ for them to escape relegation. The management and players have vowed to keep on giving everything they’ve got to try to claw their way free of the bottom three. But Saturday’s 3-0 home defeat to Wealdstone seems to have left an increasing number of fans losing faith they can turn around a spell of 22 games that has seen them pick up just one win and score only 15 goals. The twin threats to their National League South status remain unchanged – their failure to sign a goalscorer and a catalogue of injuries robbing them of key players long-term. 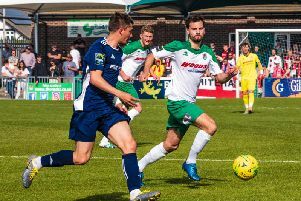 Bognor head to Hungerford on Saturday hoping for a change of fortune, but knowing they now have only 16 games to save their skins. They head to Berkshire without skipper Sami El-Abd, whose hamstring injury makes him the fifth centre-half at the club to have been crocked this season and will put him out for a fortnight. But news of other centre-halves is better – Manny Adebowale’s loan continues until after this weekend and Keaton Wood may be fit to return at Hungerford. Manager Pearce said of the Wealdstone loss: “It’s a disastrous result. You can’t dress it up any other way. When you’re in our position and you’re playing at home, to get beaten 3-0 is, on the face of it, a hammering. “In general I can’t fault the players’ effort. Their effort is as good as anything I’ve had in all the time I’ve been here. But it is a very very hard league. The Stones went on to add two more in the second half to make it a grey day at the Lane. “We conceded two self-inflicted goals,” Pearce said. “We know we’re struggling to score one goal and when you’re 2-0 down you know you’ve got to score three to win and that isn’t going to happen. Asked if surviving the drop was still on, Pearce said: “There’s enough points and if you get them you will survive. But if we look at the logic of it. “We have six players unavailable through injury who we’re having to pay, we lost another one (Sami El-Abd) on Saturday, and we struggle to sign players. So yes we can survive but it’s going to be very difficult. “When we’re playing at home and having lots of possession, and playing quite well with a good spirit, unfortunately we’re still getting beaten. We know what we need but it’s not easy. “I don’t think any clubs have come to the Lane this year and outplayed us – not even Leyton Orient outplayed us. We have the ability to stay in the league but we do need those one or two extra players in the vital areas to turn possession into goals. Coach Darin Killpartrick rued the mistakes that led to the Wealdstone defeat but said all they could do was keeping working hard to eradicate errors and turn spells of possession into chances and goals. Killpartrick said: “As a collective group we can’t defend like that. Everyone talks about getting a forward but you just can’t defend like that, you really can’t. French midfielder Richard Gilot is back in contention for the Hungerford game after a one-match band though foreard Ben Swallow is still banned. Striker Ollie Pearce was an unused sub on Saturday and may get some minutes this week.